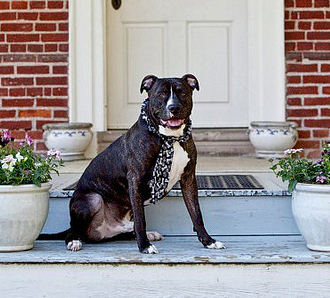 Does Other People’s Fear of Pit Bulls Change Your Relationship to Your Dog? StubbyDog asked its Facebook fans, Does other people’s fear of pit bulls change your relationship to your dog in any way? The answers revealed that our fans use their dogs to educate and enlighten people about pit bulls and make sure their dogs are ambassadors to the breed. Way to go! Thanks for sharing. Other peoples’ fears of pit bulls really only instill an immediate urge in me to try educate them, fear is a wall we put up to protect ourselves from what we do not understand, it has no bearing on reality, if we climb that wall new worlds are opened up to us! Education and the willingness to understand make all things possible, don’t hate what you do not understand, learn about it, then decide how you feel. Yes, it does, it makes me love them even more!!! It also makes me even more determined to educate people on the true nature of the breed. I had someone stare us down this weekend as I was out for a walk with my two pits. When I asked her if something was wrong or if I could help her, she said she just wanted to “see what they were” to which I replied they are dogs, haven’t you seen dogs before? Yes it makes me love my dogs even more because they are the lucky ones that got a good home! Also it makes me sad for the ones that are not so lucky! I love them so much and hate the animals (aka people) who hurt and abuse these great dogs! If I had an ideal world, I’d be able to bring my fur kids everywhere, but I can deal with the issue that some people DO have a fear or dogs/pits and I’ll respect that. As much as the stereotype bothers me, I’m a respectful person and will happily cross the street and continue my pleasant interactions. However, if someone starts being flat out ignorant and makes snide comments about MY KIDS (because that’s what they are! ), I have no problem correcting them, especially when I was being courteous. I am protective of my dog. I think I care for her even more knowing that she faces so much prejudice. It’s hard to not take it personally when people cross the street, or avoid the sidewalk we are on. Because of people’s fear of her breed, I am more cautious with her. I don’t not put her in uncomfortable situations that stress her out. I want people to see the best in her, and so they do. I am the foster of a 14-week-old health-challenged pit right now. She is the only surviving pup of a litter of thee. She is a puppy. What I see is a cute, energetic, special-needs girl that deserves a chance. At 13 pounds we’re giving her one. I am her defender and caretaker. 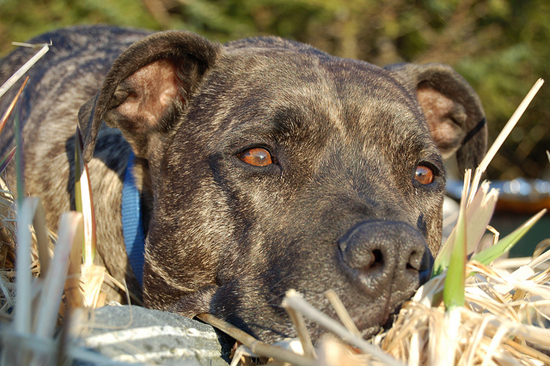 Sadly, people’s fear of pit bulls means that I don’t have a pit bull…as much as I love the breed, the fear factor has resulted in BSL near where i live, thus resulting in me being unable to take a pit bull to all the places I would want to take them to. 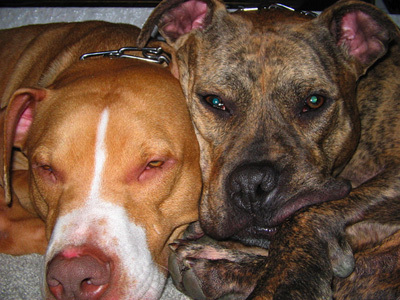 Therefore, I have a non-pit bull, but do my best to support pro-pit bull organizations as I am strongly against the discrimination that the wonderful breed gets shafted with. Absolutely not. I have four pit bulls ages 6 months to 5 years and I love when people say oh what nice pretty dogs what kind are they. Then I smile and say they’re pit bulls. I always see people make the same face. They pull back just a little and say ‘really?’ ‘I thought they couldn’t be in groups or around people in parks. Don’t you worry they might fight or bite someone?’ No! They are the nicest dogs. I don’t train them to do that, dogs only do what they are taught to do. No, I am an individual and I use my own personal experiences to guide my beliefs, and pit bulls are just regular dogs wearing a coat that is judged by ignorance and misperceptions. Yes, it makes me feel proud to know him and not just judge him by the color of his skin, wait… by his breed/category alone. History has a way of repeating itself over and over. I feel the need to educate and share stories. The Michael Vick one is tragic yet powerful. Not even PETA thought the dogs should be kept alive. I just tell them to watch the PBS update. I hope a full length documentary comes out soon. The more I meet people that don’t like my three pits, the more I love on them! They need that extra love after meeting ignorant, hateful people. Also it makes me smile, because I know what I have, and they have no idea what they are missing! I think I get more “protective” but also at the same time angry, that I have to defend her due to the ignorance of others who have put pit bulls in such a bad light. I wouldn’t say the relationship changed at all, I am just more proud of my dogs because they are so sweet and well behaved which makes them great ambassadors for the breed. I love to answer questions people have about them. I’m probably a little more protective of them than I would be if they were a different breed. Most people I meet are overwhelmingly positive and have only good things to say about my dogs and pit bulls in general, which is great. I really think the public perception of them being vicious dogs is changing. No. It does not. However, being that my pit bull is my service dog and a therapy dog, we have changed THEIR minds, one at a time. I had a foster pittie (pit mix – definitely some American Bulldog, too) and I walked her in the neighborhood (in the street – no sidewalks). Whenever a vehicle was about to pass us, I always made a point of moving to the side and showing off how well-behaved she was by telling her to sit – people would see me give the command and see her sit and look at me. After a while, many people I didn’t know would slow down when they drove past, then smile and wave at us. I also put a pink collar on her and had a (strong) pink leash – definitely drew a better reaction that something metal or studded. For sure. I hold my pit to a much higher standard for obedience than I do my other dog. Plus she is always on leash, even when my cattle dog runs loose on the trails. My hope is that by holding her to a higher standard, I will be able to show others what true responsible ownership can result in- a good dog- pit bull or otherwise. People will be petting my dogs and letting their children pet them, but when they ask what breed they are, I’ve also witnessed people stop touching them as soon as the answer leaves my lips. It’s truly ignorance at its finest. Absolutely. I realize that because I have a pit bull, people often look at me as though I’m under a microscope which means every encounter I have with him needs to be one of leadership. If I’m walking my dog on a gentle leader and others see it, perhaps they may take their choke and spike dog collars off and use a gentler method. If someone is afraid of my dog because of his breed, I know it’s my job to meet them right where they are, answer their questions and give them the opportunity to pet him if they see fit. And if they want to share their fears with me, it’s my job to listen, answer questions and share my experiences with them so that they can begin to change their perception of the entire breed based upon one good encounter. It’s made our relationship stronger and it’s made me treat him the best way I know how because it might inspire others to do the same. Yes my pittie is going to get his CGC and therapy dog certification to show people they are really awesome dogs in the right hands. I don’t have a pit – I have a Doberman. But yes, it does change my relationship with my dog. It makes me want to really get her out in the community to meet people and show them that she is truly a wonderful dog even though she may look “scary.” Once people meet her, they are surprised that she’s so sweet. I guess they thought she was going to eat their face. Other people’s fear makes me want to help her be an even better ambassador for her breed so she can prove the fearful wrong. Other people’s fear also makes me extremely protective of my little girl because far too often fear breeds hate. It makes me glad that he doesn’t understand words. Just yesterday we had a person leave the dog park because my “pit bull” was there. My guy, Bauer, is an 11-month-old sweetheart and wouldn’t know hate if it smacked him across the face. I take it as my job that he grows up only knowing a loving kind world. No, because my real friends and family know how loving he is, and those people who don’t want to take the time to know him aren’t worth wasting time on!! My sister has a pit mix and the ONLY way it changes it: I become MORE protective of Max, and find myself defending him more and trying to educate closed-minded people about the breed/mixes more and more, which SHOULDN’T have to be done. As others said, people’s fear doesn’t change my relationship with my dogs, but it does make me aware of the need to educate. We have three dogs–a Rottie/pit mix, a pit mix, and a Border collie mix. The Border collie was likely abused as a puppy and she is very reactive. She’s never bitten anyone, but we have to be careful with her. Of our three dogs, the Border collie’s the “dangerous” one. The pits are sweet — and the Rottie/pit mix, Crow, is my “Wal-Mart greeter.” My husband says of Crow, “He loves to go for walks and see all the friends he hasn’t met yet. Absolutely! It makes me want to get her out there more than ever so the world can see the true nature of this breed. We intend to make sure she reaches her full potential as a therapy dog so we can do what we can to promote pit bull awareness. Now would I be so on fire to do that if I had a Lab? My Minerva helped a little girl one day who was VERY scared of dogs. We were at an elementary school teaching second graders about dog bite prevention when I noticed that this one girl wouldn’t come within 20 feet of the two pits I had with me. When I talked to the teacher about it, she said that the girl was very, very scared of dogs. Some of the kids were making fun of her for it. So I took the little girl out into the hallway where it was quiet, laid Minerva down on the floor and encouraged the girl to touch my fingers. Then I slowly got closer and closer to Minerva until the girl was brave enough the touch the very tip of Min’s tail. It took about 30 minutes, but the girl finally pet Minerva’s rump. It was a huge breakthrough for the little girl and the smile on her face was so worth the time we spent. She will now always have a positive outlook on pit bulls because someone was patient enough to give her the time that she needed to pet a dog for the first time in her life. Yes! For the better! When I hear someone use uneducated misinformation about pit bulls, I LOVE telling them about how awesome my pit mix is! I also love bringing him to family functions, watching him get love and praise from everyone then hearing my once ‘pit bulls are horrible’ family talk about how awesome he is! I just get more protective of my baby…and I try to help the person understand that there’s no need to fear pits. I even offer up the story of having been bitten by a pit and I still LOVE them! It’s all an individual thing. By the way, the pit that bit me was my baby’s father and she’s the best girl EVER! She would be HORRIFIED if her teeth broke skin. It’s in the training. Absolutely NOT, except to make me love them MORE because they are so painfully misunderstood!! I make my own choices based on my own experiences. It reminds me of the continuing need for training and behavior tune-ups with my dog. As much as I possibly can I want her to be a good example of the breed, even though she is a mix, so socialization and lots of exercise, plus quality eyeball to eyeball time are a must. Yes. I believe it has definitely had an effect on how I am towards my baby girl. I hurt for her when people assume the worst because of the way she looks. She’s a brindle pit/great Dane mix. I actually had this jerk at a local pet store tell me I should never admit that she’s part pit unless I like to cause problems for myself. This puppy is my fourth child. I’m supposed to lie about what she is? You know what, while we’re at it, my other kids are Sicilian, let’s be ashamed of that too. I’ve even had people ask me to put her away when they come over. This is HER house too! She will be 2 next month, she just found her bark last week, and doesn’t have a mean bone in her body. She is so timid, so loving, and soooo tolerant of all the torture she gets from my 6, 9 and 14 year olds. She has NEVER displayed any kind of aggressive behavior, not even toward other dogs, so it really gets under my skin when people assume she MUST be a bad dog because of the way she looks. When we act this way towards people, it’s called discrimination. So, NO, Ii won’t lock her up so you can bring your unfounded hate and ignorance into my home! This dog has been such a blessing to our family, I only hope that we are good enough for her. If anything, it makes me more proud of my loving, well-behaved pit. It can be frustrating, but I just think- Hey you- too bad you don’t know what you are missing out on, keep walking in fear for no good reason!!! It make so proud of him when I can prove people wrong. I take him with me to the pet food store and there are always a handful of misbehaved dogs in there. He walks through and ignores everyone and is just awesome. I always end up buying him a treat because I am so proud that he isn’t a spaz like the other dogs. Absolutely not!! People I don’t know do treat me differently because I have and support pit bulls. They look at me like I’m crazy. People are stupid and judgmental. And the media – don’t get me started. Hell no, both my babies are Caine Good Citizen pups and I love them more every day. The better question is… How many “Human” Good Citizens are there????? It only makes me try harder to keep them always on leash, regularly trained. (CGC, TT, and one has UWP) the other is working towards rally titles. In the meantime, I can smile as I break peoples’ stereotypes that we are all drug dealers or criminals! We behave politely and participate in as many demos as possible! If anything I love them more. It’s just motivation to work with my dog to make him a great ambassador for the breed and change peoples’ minds. 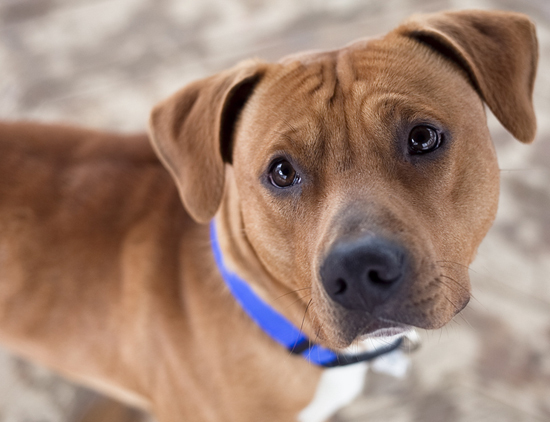 Many people comment on how well behaved my dog is (even though he is an American Staffordshire terrier and not an American pit bull terrier – many people still consider him a pit bull). It’s important for any dog to be properly socialized and well behaved but even more so with these dogs since they are under the microscope. I’ve also had many people tell me that they’ve always had a bad view of these dogs because of the media and incorrect information. They tell me that they’ve met someone’s pit bull or their kids have one and they just love them to death! All we need to do is educate people instead of being negative to people who don’t have a clue – it’s only feeding in to their beliefs. Absolutely! I am far more protective of my dogs than I would be otherwise. I make huge life decisions based on their safety and comfort. It makes my relationship with my pitties stronger. I refuse to change the way I do anything with my dogs. Every day we politely walk on the sidewalks of our city center, and take a break at a little park near the common. Sometimes I get the double take, sometimes I get the wide berth, sometimes after a person who has mixed feelings about pit bull type dogs has seen my dogs a few times, they ask questions like “I heard when these dogs get near other dogs they tear them apart” or “aren’t they vicious?” When I hear these questions, I know the barriers have come down and my little ambassadors have won over another skeptic. Knowledge is power. It doesn’t change our relationship; it’s already very strong and will continue to strengthen. My bull and I use it as an opportunity to help those whom are unsure or unaware of pit bulls, as a building block to positive relationships and being good citizens. We try and set a good and positive example of the relationship a person and their pit bull can have. 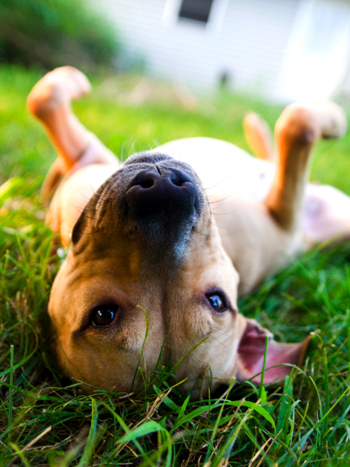 We use the experience to explain what gentle, loyal, sensitive, smart and athletic dogs’ pits are. 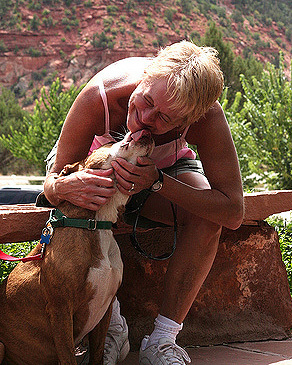 To know love and be loved by a pit is like no other. Oh I must say I do like it when people move their prams out of my way!! If only they knew. I had a female pit for 13 years in the 80s – 90s. She was a nice dog. You hear so much crap I was afraid to get another. In the past couple of years I have had two intact male pit bull neighbors. One was a mix and the other was a pure pit. They were not treated well (kept out 24 /7 in heat, cold and rain). We made friends with them, gave them some attention, affection and treats. They were two of the sweetest boys I have ever met. I had my first experience with pit bull racism recently and honestly it made me cry. I told the person that I owned two pit mixes. I explained how it’s all in the training and that they are wonderful dogs. I’m very protective of my baby, but I love seeing people fawn all over her for bring a good dog; then looking shocked finding out her breed. It’s a great way to educate people. I have a Staffie, as we are not allowed pitties in the UK and yes I take more time to make sure she is the best behaved, friendliest dog in the park to which she most definitely is. I also take more care in training her to have respect for people, if she was a cocker or a lab I would be much more relaxed with her running up to strangers. Staffies over here in the UK have a bad rap just like the pits in the US. If it does, it just makes it stronger. I’ll defend these guys to the end of the earth and back. But it’s really great when people start petting them (especially Inara because her huge ears are such an ice breaker) and don’t even realize she’s a pit. When they ask and I say pit bull, most people love on her even more and talk about how misrepresented they are. When walking my two dogs, people clearly react with fear to my big boy. Funny! Because just last week a woman with two extremely aggressive Aussies freaked out on me when I walked past her with both of my dogs off lease and neither of them reacted to her two spazzes. I’ve seen people clearly love up on my little female and complete shy away from my huge boy. Since then I’ve put a pink flowered collar on him and call him to heel when approaching people while my female gets a free ride. Hell no. Other people’s fear causes me to pay attention when walking my dog because she ignores most people, but if you’re scared she’s going to try to approach you and I’m concerned about how the person will react because my girl is very excitable and tends to jump up a lot. There’s no way other people’s fear can cause me to feel differently about my dog. I love her and always will. My most recent rescue is getting her CGC (which the instructors said they would be shocked if she didn’t get it because she’s so attentive and well mannered) and then move onto getting her therapy certification! Knowing I was going to do this, I named her “Mera,” which is short for Meraviglioso (bully in Italian). Now when people ask how I got the name, I can proudly say she’s a “bully” that does great things! I guess it would depend on the perspective one takes. No, my relationship with my bullies isn’t different due to others misunderstanding them. 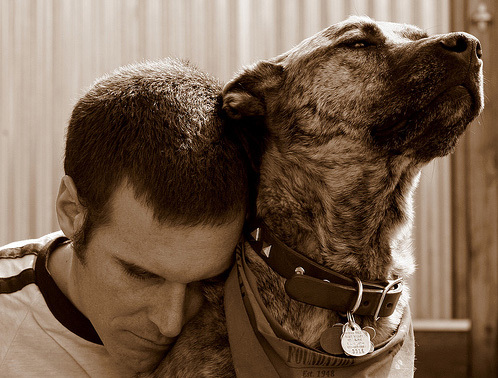 I will love any dog that graces my life regardless of breed. It is a life-long connection. 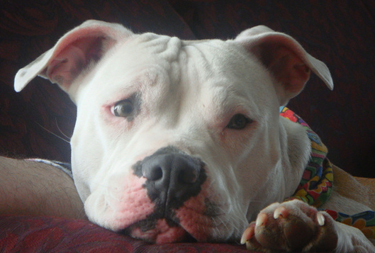 However, when I adopted my Gracie, a former bait dog from a fighting ring in Indiana, I also adopted the honor and responsibility of becoming an advocate for the breed. So in that sense, I guess that does somewhat guide the relationship I have with her. Like Noel, my Gracie now is CGC & Delta certified, a therapy dog. It’s great to be able to tell that to people when they see us out and about and then engage them in conversation about it. 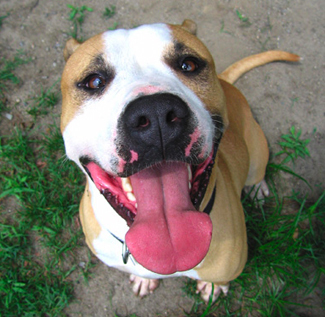 What wonderful power to change one’s thinking, one positive pit bull experience at a time! The only thing that has changed in the relationship with my dog is that she wears bright nail polish on her nails. For some unknown reason, people who are afraid of pit bulls or dogs in general suddenly loose that fear when they see hot pink nail polish on my dog. I see them look at her feet, then look at my hands. I swear they are mentally counting my fingers to make sure they are all there. Then the fear seems to ebb away and they approach her asking if she is wearing polish, then they ask if they can pet her. Who would have thought that nail polish could do so much to change the minds of the masses and ensure that BSL will never ever be enacted in my town or the towns around me? My fiancé and I adopted a fairly sizable pittie from our local shelter. We are training him to act as my fiancé’s mobility and emotional support service dog, so he gets to come everywhere with us. Normally the policy is to not pet service dogs, but we have a patch on his vest that says “ask to pet me, I’m friendly” because he is a pittie. It breaks my heart when people shy away from him, and it hurts even more when a parent shoos their child away. It makes me love and spoil him more. And it makes me defensive of him (I guess it’s the mom in me coming out). We had issues with the college we attend allowing Goliath on campus even though the laws in NY say he has to be allowed, it was because he was a pit he was accused of having a “hostile demeanor.” Let me tell you, they found out what a hostile demeanor was when I went into their offices. I cannot have a pit bull right now. My husband is military and because of all the different cities, counties and countries that have bans on pits it makes it extremely difficult to have one. I do, however, work at an animal shelter near me that receives a lot of pit bulls and I work very hard to help the people who come to adopt learn the TRUE personality of the pit bull. Working at the shelter with so many of the pitties has actually turned me into a lover of the bully breeds, especially the pit bull. I’ve grown very attached and want to help people to see the dog that I see: a loving and intelligent companion who is just misunderstood and stereotyped. Not at all, their fears as far as my dog is concerned are completely unfounded. Even in the shelter, when people walk by they often see me sitting on a kennel floor covered in pit bulls and I would have it no other way. Their fear is something I try to dispel without understanding it unless they have firsthand reason for it. Most people I’ve talked to have no rational reason for their fears except that they believe everything they are told. My mother was bitten by a cocker spaniel as a child and had always been leery of them until I adopted one several years ago. Now she no longer holds that grudge. Again it’s a case of punish/blame the deed, not the breed. No. I always believed each dog is individual, just like human. One can’t judge a dog by its look or breed, just like we cannot judge a person by his/her look. Pit bull’s negative reputation only makes me want to be sure that she’s well trained and well behaved, and keep her away from trouble. We practice, practice, practice every day on obedience, especially recall in every situation. She seems happiest when “working,” so it works for both of us. I’m the very proud foster mom of a wonderful pit/staff little girl. Every chance I get I tell people what kind of dog she is. 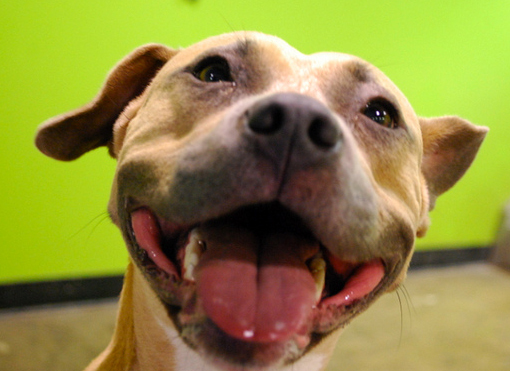 She is a sweet, happy, loving dog that deserves the same chance at life as any other. Thank you for sharing and for the important work you do as a foster mom! I could never love my pit anymore or any less than I already do. When I take him out an he goes up to little kids a licks them an loves to play with kids adults an other dogs. When people say ” he’s so sweet an good with kids, what kid of dog is he”I smile an proudly say he’s a pit bull.. People normally give me a weird look an say “arnt you afraid hell turn on you?” I can’t help but laugh an say ” god no were best friends we know each other inside an out.” I feel the need to take my pit to many public places so people can see what an amazing breed they are. Thanks for sharing, keep up the good work changing peoples’ minds, one at a time. The general public’s misconception of bully breeds has definitely had an impact on my relationship with my dog, who is a rescued pit/mix. One of my favorite encounters was in a pet store when I was with my dog and my friend’s 105 pound, ear-less pittie who was seized from a fighting ring in the south. A woman and her young daughter were commenting on how beautiful and well behaved the boys were. When we told her that they were both pit bulls she was very surprised. When we gave her the abbreviated version of their less than pleasant start to life, she started crying. On the other hand, while I was working on my dog’s “auto sit” (sitting whenever I stop and waiting for me to release him), a very muscular and intimidating looking man passed us a few times and always steered clear of my dog. After the third or fourth time, he asked what kind of dog he was and why I kept making him sit. I said that he’s a pit bull and that I’m working on his training, specifically to discourage him from crossing the street without my permission or being fidgety while I’m having a conversation with someone. The man asked why a dog would need to do this, to which I responded “Would you want your child blindly running into the street?” I don’t think he understood the correlation, but hopefully it gave him a little insight to how well behaved these dogs can be. 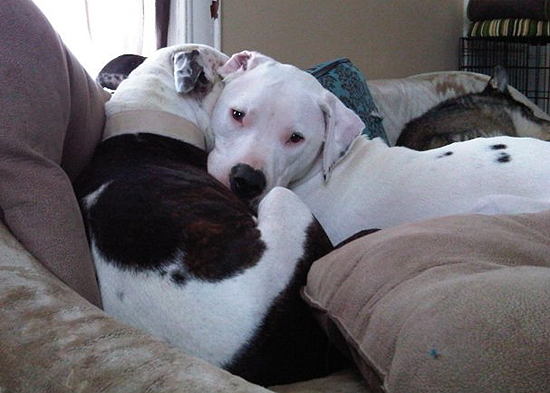 Thank you for sharing your story, it’s so nice to hear how many people have such well-behaved and wonderful pit bulls. 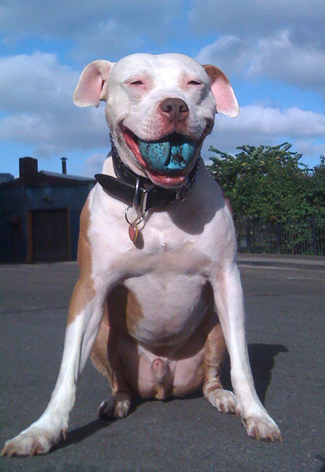 Thanks for sharing and it’s good to hear that you have had such positive experiences owning a pit bull. Sweetest dog I ever had was a pit. People were usually surprised as many have never seen one in real life. Raised 3 babies with her and the only time any of my kids were bit by a dog was the neighbors chihuahua.